The Crop Trust and Aimprosoft continue developing a range of IT projects, including Genesys. We recently visited our long-standing client Global Crop Diversity Trust (Crop Trust) in Bonn, Germany. We were warmly received by the team that oversees the information systems that link the genebanks that safeguard crop diversity with the users (plant breeders and researchers) that adapt the crops that feed us all. We discussed current projects (Genesys PGR, Genesys catalog, REMPS etc.) and how best to continue our collaboration. In February 2017, the Crop Trust and Aimprosoft signed a three-year agreement wherein we will support the development of software projects for the Crop Trust. We are excited to play a role in the noble effort of making sure the information on crop diversity is safe and available for all users worldwide. We’ve been cooperating with the Crop Trust since 2013, and we are honored to see that our efforts contribute to the development of a global system that ensures the safeguarding of crop diversity, i.e. the building blocks we — all of humanity — need for a food-secure world. Through Genesys, genebanks are able to publish information on their collections for the world to see where crop diversity is conserved. 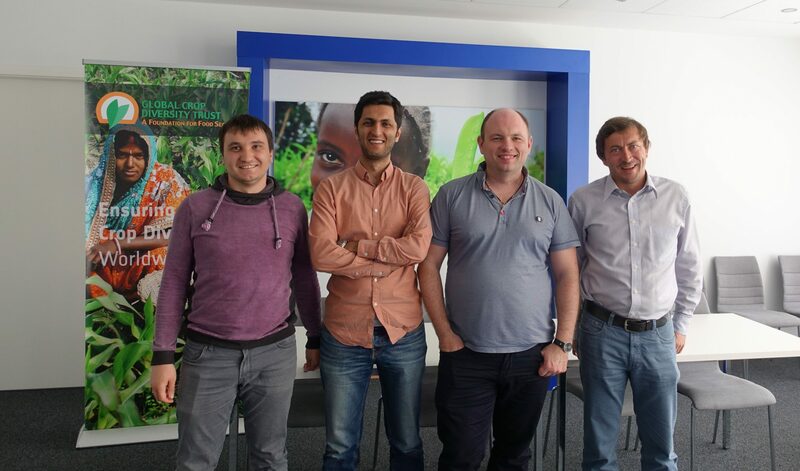 The meeting was initiated by Matija Obreza, Information Systems Manager, who shared some historical facts about the Crop Trust and the prospects of further collaboration with Aimprosoft in the development of various information systems. The Crop Trust considers the Aimprosoft team as a synergetic partner in developing IT projects for internal purposes, as well as in support of its global network of partners. During our meeting we talked about a number of projects that are in need of upgrading, refining, automating business processes, managing security updates, etc. According to the International Center for Tropical Agriculture (CIAT)’s Policy Brief №25, “countries’ dependence on crops that originated in other regions has increased over the past 50 years in concert with economic and agricultural development and the globalization of food systems”. Genesys plays a key role in displaying where one can find and request plant genetic resources that are used in crop improvement. This is essential for achieving food and nutrition security. Today, most national agricultural production systems — and 70 % of our diets — rely on the genetic diversity of “foreign” crops, meaning plants that were domesticated in some far-away place. Rice originated in Southeast Asia. Maize in Mesoamerica. Potatoes in the Andean region. So we see that all countries are interdependent when it comes to these resources. We appreciate the vote of confidence that the Crop Trust has given us, and hope to succeed in our common cause. Learn more about watching the video here. Aimprosoft is a Ukrainian software development company headquartered in Kharkiv, Ukraine. A history of the company goes back to 2005 a year when it was established. A customer-centric approach has grown us into a solid team of professionals which provides dedicated resources of the highest qualification.